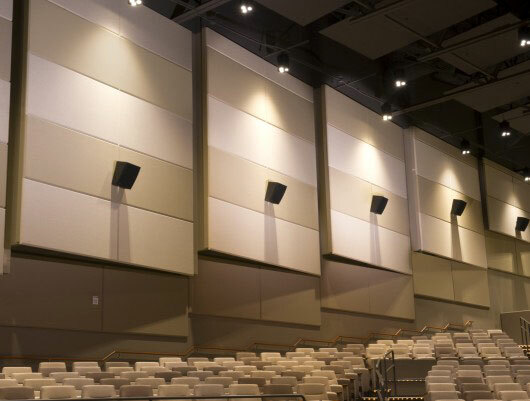 Fabric Wrapped Acoustic Panels - A. L. Harding & Co.
Prefabricated fabric wrapped acoustic panels are the ideal economical solution for treating noisy reverberant spaces. With a wide array of fabric selections, edge details, and finishes, fabric wrapped acoustic panels offer both aesthetic versatility and acoustic performance, making them visually appealing as well as functional. Fabric wrapped acoustic panels can be used on both walls and ceilings in the form of flat panels, curved panels, clouds, and baffles. Today's modern CNC technology allows for fabric wrapped acoustic panels to be cut precisely into various shapes and sizes, allowing for unlimited creativity and design. 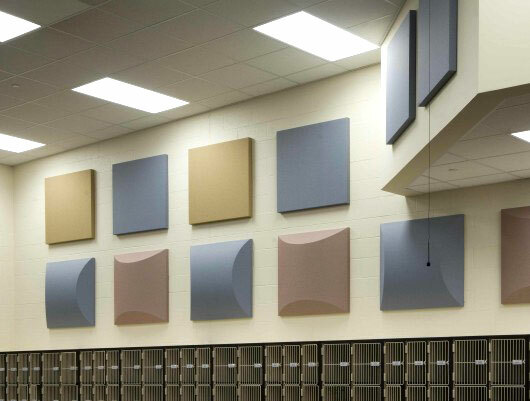 Prefabricated fabric wrapped acoustic panels are the ideal economical solution for treating noisy reverberant spaces. Why do I need fabric wrapped acoustic panels? 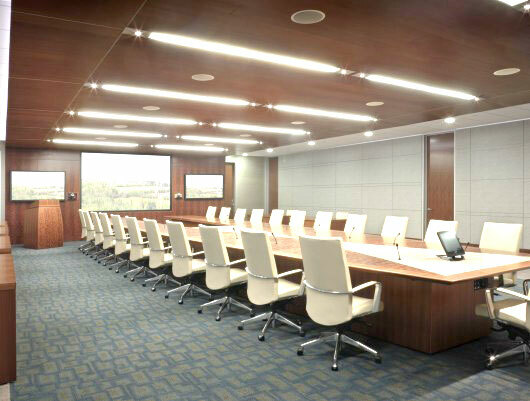 Large spaces such as conference rooms, gymnasiums, and multi-purpose rooms, tend to be made up of a lot of hard surfaces such as drywall, plaster, and wood floors. These surfaces are referred to as acoustically reflective, which means that sound will bounce off of them. Sound waves travel in 360 degrees and will continue to bounce back and forth until that energy is dissipated. These reflections build on each other raising the overall sound level of the space. If someone is speaking, the listener is hearing multiple instances of the same sound at slightly different times, making speech intelligible. This is known as acoustic reverberation, and the amount of time it takes for this sound energy to decay below audible levels is known as the reverberation time. So how does a fabric wrapped acoustic panel make a room quieter? To correct a room that is too reverberant, you need to tone down the hard wall and ceiling surfaces with an acoustic absorber such as a fabric wrapped acoustic panel. 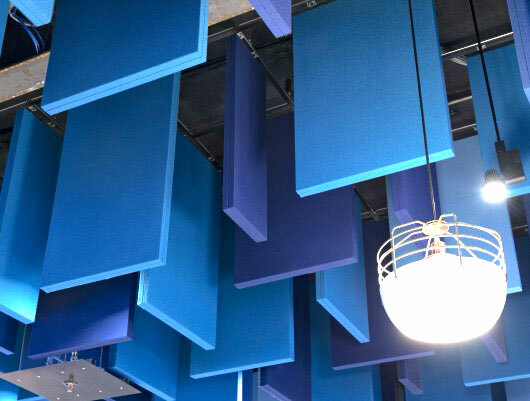 Acoustic panels are made from lightweight porous materials that are acoustically absorptive. Fabric wrapped acoustic panels are fabricated with a high performance acoustic fiberglass core which is an excellent acoustic absorber. When a sound wave hits the panel, rather then being reflected back, the glass fibers in the core absorb sound by vibrating together transforming the sound energy into heat energy. By adding acoustic panels to a space, noise reduction in the 3 to 5 DBa range. can be achieved. How do you determine how many fabric wrapped acoustic panels are needed for a particular space? The amount of acoustic panels needed in a given space will mainly be determined by the dimensions of the room, size and thickness of the panels, and the desired reverberation time. The purpose of the room will determine the target reverberation time. In a lively venue such as a gymnasium, 2 seconds would be acceptable, whereas a conference room should be in the .5 to 1 second range. With this information, acoustic consultants, engineers, and manufacturers can apply a formula to determine the amount of absorption needed in a given space. Since there are a lot of other aspects that can affect the acoustics of a room, it is always best to contact a professional fabric wrapped acoustic panel manufacturer's representative that can assess your goals and budget and assist you through the entire project. Where do I buy fabric wrapped acoustic panels? If you've made the decision to invest in fabric wrapped acoustic panels, quality is crucial. You will want to choose a reputable manufacturer such as Conwed Designscape, or MBI Products Company. Their state of the art facilities ensure a precision cut, high quality acoustic panel free of defects in material and workmanship. Conwed Designscape and MBI have teams of professional sales representatives throughout the country ready to assist you through all aspects of your project. Why should I choose Conwed Designscape or MBI fabric wrapped acoustic panels? With many manufacturer's to choose from, the most important thing to consider is who will you be working with? The role of manufacturer's representative is crucial in being the liaison between the customer and the fabric wrapped acoustic panel manufacturer. Are they knowledgeable, responsive, and dedicated to your project? A.L Harding & Co. LLC has been proudly servicing the architectural community, construction industry, and building owners in Western Pennsylvania and West Virginia since 1986. We are dedicated to our customers, and will be there right along side you to ensure a successful project. To get started on a project or learn more about fabric wrapped acoustic panels, give us a call at 724-745-3001, or CLICK HERE to send us a message.